Glutinous Rice Flower for the outside… Red Bean Paste for the inside! We found Glutinous Rice Flower at Square Supermarket. Soojeen loved Square because they had so many Korean items! But they didn’t have any Red Bean Paste. We went across the street to Hoa Binh and found it! A big ball of dough! Once the dough was ready Soojeen got everyone involved flattening out the balls, filling them with red bean paste, and then sealing them up! I’ve found that the peeps who choose to cook here seem to take the experience to a deeper and richer level. Whether or not the pasta is overcooked doesn’t much matter, it’s the community that preparing and sharing food creates. 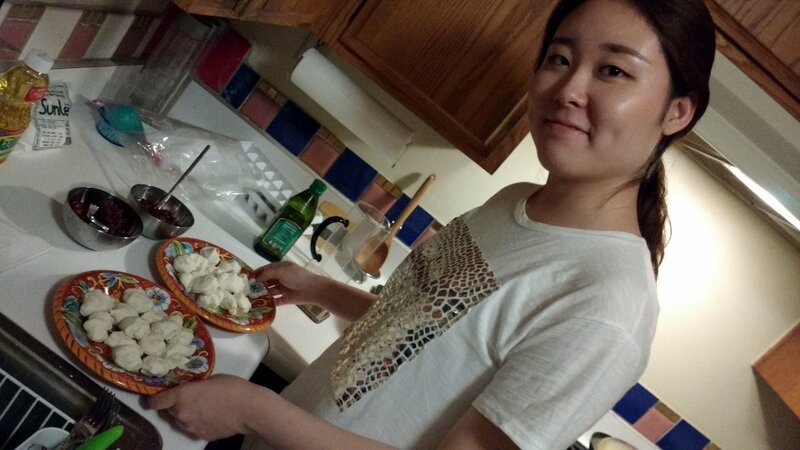 Tonight Soojeen took that further by getting everyone involved in the community preparation of our Korean Donuts. Awesomesauce! Glenn, Johanna, Celeste & Soojeen – happy bakers & diners! Glenn! It is so nice!! Thank you Soojeen! The donuts were so delicious!